Im trying to follow your guide, but I cant seem to find where to make the changes in step 2 and 3, I dont know if its because i´m on a newer FW or if i´m just stupid or blind (maybe both). Can you please point me in the right direction? Behind Config Tree button second right of main tabs. Added full (removed some non-public details, though) config file, if you compare it side by side with yours you should be able to make relevant changes. I don't have this up and running anymore as gave up with Telia TV, but in case it helps you get it working, you can find me at paypal.me/jussipalo. Thanks for a great write-up. May I ask what is the purpose of the firewall rules in this case? I'm guessing that IPTV should work without any firewall rules, right? I doubt it will work without any firewall rules. You need to allow IGMP and multicast and I don't think you want to completely turn off firewall for that interface although it would only be the IPTV vlan. Thanks, yes, that makes sense. 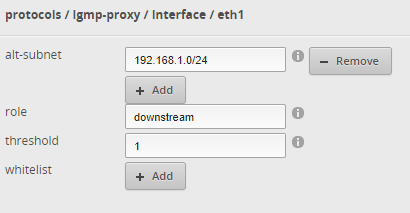 For the testing purposes, I've started with no firewall on eth0.6 (iptv come on vlan6 in my case), but unfortunately the STB says that the service is not available in this network. Not sure what's the problem, but someone suggested that I may need to use policy based routing or load balancing to force all STB traffic through eth0.6, although I don't really know how to do that. Also, there seems to be some issues with ER-X and igmp-proxy needing restart.. It's not as simple as I thought it would be. I'm now using a VLAN aware solution, but I don't really like it. Could you please explain why you used 'no-update' for both 'default route' and 'name server'?